Free Convention Center Shuttle stops by the Club House. No Groups under 25 allowed. Vista Cay at Harbor Square. Tuscan themed Vista Cay offers spacious accommodations that are ideal for either the family wanting to be close to all the excitement of International Drive, couples getting away for a short break, as well as the discerning business traveler in town for a meeting or a big convention. Lavishly furnished, this beautiful 2,001 square foot open plan home with tasteful interior design boasts a master bedroom featuring one king-sized bed, the second bedroom has a king-sized bed, and the third bedroom has 2 full sized beds. This impressive home sleeps a total of up to 10 guests. 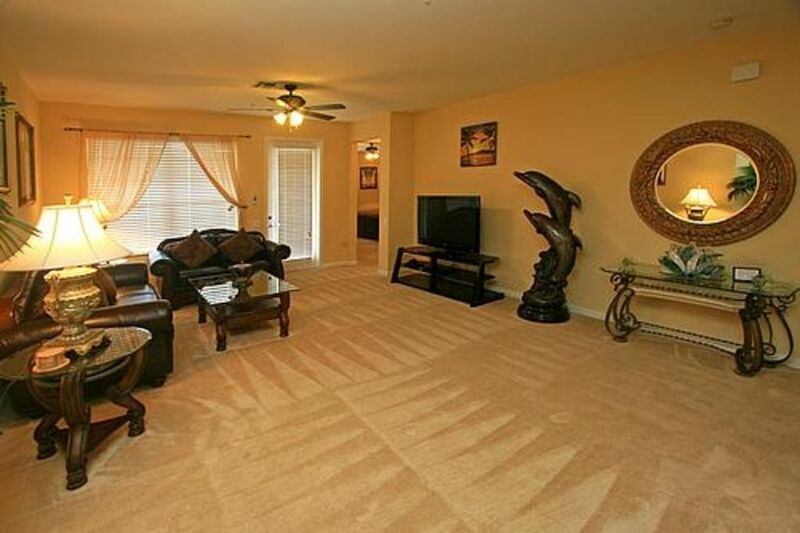 This layout has a spacious owner's suite, 2d master bedroom and a covered lanai. The comfortable living area has a leather suite, 50'wide screen TV, freeWiFi, Playstation 2 and cable TV. This is where you sit back, relax and think to yourself ‘why have I stayed in a hotel room, when this condominium offering a generous layout, gorgeous furnishings and all it’s comforts of home. I am a Realtor Associate. I am the owner and a hands on manager. I take a great pride in making my beautiful properties very comfortable for our guests. The Villa is very conviently located in middle of everything - Very close to all the parks - 2 miles to Universal, 1 mile to Sea World and 5-10 min to Disney Paroperty. We are also very close to Sand Lake Drive and International Drive - with a lot of Fun staff to do , the best restaurants and shopping. We have 2 bathrooms . I is a part of the Master Suite - huge Bathroom with a walking glass shower, large bath tub, separate part for the toilet, his and hers sinks. We provide a lot of towels in the bathroom and extra in the Laundry room on the shelf above washer and dryer. Our 2 d bathroom is shared between 2 d and 3 d bedrooms and off their hallway. It has tub, shower, sink and a toilet. We have famous Shingle Creek Resort and Golf Course across the street. Vista Cay residents get a discount in that Golf Corse. There is a running - biking trail around the lake . You can enjoy the wildlife - beautiful birds walking around. Out beautiful Resort Style pool is lake Front. Pool is beautifully landscaped with the bar by the pool. There is a jacuzzi and a separate kiddy pool. We have a central AC in the villa. There is a thermostat for your convenience to control the temperature. There are also lighted ceiling fans in every room for your enjoyment. We have central heating system in the villa. There is a thermostat for your convenience to control it. There are also lighted ceiling fans in every room for your enjoyment. We have a laundry room in the villa off the kitchen. There we have full size washing machine and the dryer. There is a shelf above them with extra towels and sheets for the sofa. The wash clothes. There are plenty Free self parking outside right next to the Building. 2 cars are no problem. We have plenty of towels for your convenience in each bathroom and also extra towels in the laundry room on the shelf above the washing machine and the dryer. We have electric full size oven in our fully equipped kitchen. There are also Electric stove, full size Refrigirator, dishwasher, washer and dryer in the laundry room of the kitchen. We have a pantry in the kitchen for your convenience . This is your Home away from Home . So when grocery shopping and bringing them to your vacation home - there is plenty of room In the pantry . Our gourmet cooking kitchen is fully stuffed. We have everything you need, pots and pans, dishes glasses, silverware , cutting boards, cooking utensils.mixing bowls, tea cups, plastic ware for kids. Please feel free to bring books with you - the villa is very large (2001 sq feet of the open floor plan space ) and will be plenty of room to store them. There is a Play Station 2 in the villa . So please feel free to bring your games and keep the kids ( and adults ) entertained. . We also have a game room in Club House by the pool. There are pool tables in the Playroom of the Club House . You will be right next to the pool area . You can have a drink at the bar by the Pool , listen to the music playing and have a great time ! You can bring toys for your kids - the villa is very large and there will be plenty of room to store it. For your baby we have a Pak-n-Play, booster Chair and Umbrella stroller in the condo. We have a PlayStation 2 next to the Large TV in the Living Room. Please feel Free to bring the games and entertaine kids and adults alike. We also have a Game Room in the Club House by the Pool. Our lawns are beattifylly landscaped for your convenience and enjoyment. There is a Jagging /walking / biking trail around our Lake Cay. Enjoy it and watch wild birds walking by the lake. You can rent canoes and take it for a beautiful , quite ride in the Parks of Orlando. There is a walking - jogging - biking trail around our lake Cay for you Heath , fitness and enjoyment. Please use it And watch wild birds walking by the Lake. Please do not approach wild life. Magic Kingdom I'll take you On the Boat across the Large man made Lake. Any water sports gear you desire can be rented. Please refer to the web search . If you are a vivid Tennis player you can find a place to play Tennis in Orlando . Our beautiful villa is all 1 level - no stairs. It is wheel chair accessible. There are 2 large elevators inside the building that can accommodate wheel chair - taking is upstairs. Our community is good for all ages. Enjoy yourself and have a good time ! Very large Free Style pool overlooking the lake. Beautifully landscaped. Bar by the pool. Lounge chairs and Umbrellas are Free. Very large jacuzzi in the pool area. Enjoy going from the pool to the hot tub and back. You can have a drink in the bar by the pool. Relax on the lulaunch chairs or have fun in the game room. Spacious and clean. Great location. Our family of 5 had plenty of space for our week long stay. The unit itself was very nice. The beds were all comfortable. We were there over spring break and while the complex was very crowded, it was still family-friendly. Irina was very attentive and check in/check out went smoothly. A word of caution: Do not attempt to cheat the checkout time like you might at a hotel. If it’s 11:00 check out, the cleaning person will be at your door at 11:01 to get the condo ready for the next guests. It’s not a complaint, and the woman who cleaned ours was very polite, just a heads up. The pool was nice and very close. Drinks there are rather pricey, and outside adult beverages are prohibited, so plan accordingly. My only criticism is the unit needs some updating/TLC. New carpet, a new desk chair and removal of a few damaged decorative items, and the place is a palace. I would recommend this place if you are looking for a good place to stay in Orlando. We really liked that spacious unit. Irina was great in communicating, when we had questions. The place was equipped with everything we needed. We cooked meals too. More value for your money than cramped small hotel rooms. Like the beds and had TV in each room. Really nice place to stay. Thank you. We loved the place ! Had very good time wit our family. Also very convenient location . Close to all parks. The condo was close to everything, great location. The master restroom could’ve been cleaner and the carpet as well. We would definitely stay here again. Irina was available whenever we needed her. Can’t wait to come back!!! The best location - in the middle of everything! If it’s golf you enjoy, then we have the superb ‘Shingle Creek Resort’, which boasts an 18 hole Championship Golf Course which is just across the street from the resort and guests staying at Vista Cay are offered a discounted rate and free club rental included in the price when playing a round of golf, which can result in a near $100 saving on the regular visitor fee - plus there are at least 15 other golf courses within a 10 mile radius too! Saturday - Saturday Rentals preferred No Groups under age 25 are allowed. No early Checkin - Late Checkout without prior athotization .